As a pet owner, you may have trouble finding a new place to live due to the restrictive policies in place in many apartment communities. You may find more success with independently owned properties, as some landlords are less obstructive than company-owned complexes. Regardless of the type of property you want to reside in, seeking assistance in your pet-friendly housing search can help make the process easier to navigate. There are several resources available for you to use before you spend the better part of a Saturday afternoon (or several) combing through ads. The following information can help you locate local organizations who can help direct you to listings that are pet friendly. Additionally, you will need to understand how to read and ask for legal protection for the property when you move into your pet-friendly home or apartment. Use the information below to help you streamline your search and help ensure that the home you do find is one you and your pet will be happy with. 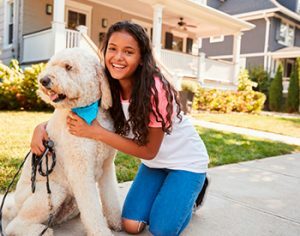 When you are seeking pet-friendly housing for the first time, it may be beneficial to seek help from resources available in your community. Animal shelters, humane societies and control agencies may be able to assist you in your search to find a new home for yourself and your pets. Many of these organizations keep a list on hand of apartment complexes in the area allowing residents to have a pet. Unfortunately, there may be some restrictions to this rule, as some complexes prefer to keep certain breeds out of the community. There may be additional limitations, such as a weight restriction for your pet. However, you may not find an issue with these restrictions depending on the type of pet you have. When an organization has presented you with a list of properties allowing residents to have a pet, spend time researching each option on the list to find the best choice for you. You may not have to heed certain restrictions if you have a pet cat, bird, guinea pig or other small animal. These pets typically do not face restrictions, although it varies on a case-by-case basis. If you are unclear of the pet policy for an apartment community, simply contact the community directly to determine how the policy may pertain to your pets. Additional resources available to aid in your pet-friendly housing search are local real estate agents. Having the help of a professional can help significantly. Real estate agents can check the detailed listings for both apartment complexes and independently owned apartments to help you determine what is pet friendly and what is not. If you have found a property you are interested in renting, but the landlord seems to be on the fence about allowing pets, you may be able to appeal to him or her to show your pet is not going to be a burden. Many landlords and complexes choose not to allow pets on the premises as there are numerous complications that can arise from having an animal present. Not every pet owner is going to clean up after his or her animals or train pets to refrain from barking at every new noise. If you have a well-behaved pet, you may be able to plead your case with a potential landlord. Offer to introduce your pet to the landlord or property manager for the home you are interested in to show firsthand how well behaved your pet is. You can invite the landlord or property owner to your current place of residence to show the apartment has not suffered any interior or exterior damage as the result of having a pet on the premises. In doing so, you are building your case by giving direct evidence of how you are a responsible pet owner. You may find it useful to request personal references from past landlords to further appeal to prospective landlords during your housing search. By hearing directly from a former landlord who knows your pet’s tendencies, a new landlord may be more willing to accommodate your pet at the new property. You can gather references from your vet as well speaking to the health and behavior of your pet as further proof of his or her good tendencies. If you have a dog who has completed training recently, supply a potential landlord with the completed certificate stating what your dog has learned. Each of these items helps to strengthen a landlord’s opinion of your pet and can help you secure a property within your desired timeframe. When you have found the perfect place for yourself and your pet, you must ensure there is a pet addendum included in your lease as legal proof of the agreement you have made with your landlord. A property manager or condominium committee can provide proof of this agreement if you are moving into a complex or community rather than into an independently owned property. A pet addendum in your residential lease agreement provides you with the protection and security you need if any issues arise during the duration of your time at this home. For example, if a landlord or property manager decides he or she no longer want pets on the premises and tries to evict you, you may be protected from this happening due to the presence of your pet addendum. Your copy of the lease and your landlord or property manager’s copy of the lease must both expressly state that your pet is allowed in the property for the duration of your lease. Do not settle for a verbal agreement alone, as this can be retracted at any time and is often impossible to prove if you want to file grievances against your landlord. If you are moving into a community with a no-pets policy written into the existing lease, ensure this is crossed from your lease before you sign your forms.